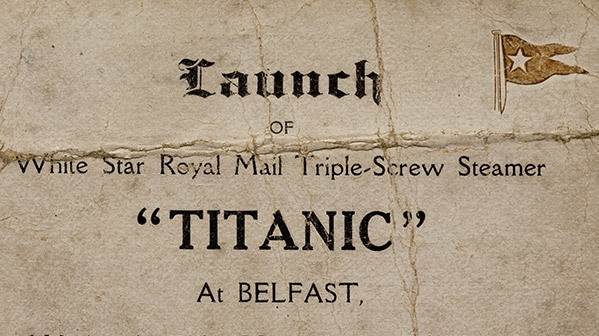 Shortly after noon on 31 May 1911, a huge crowd gathered at the Harland and Wolff (H&W) shipyard at Queen’s Island in Belfast Lough for the launch of the great transatlantic liner, Titanic. Among them were many of the workers who had built her. This admission ticket belonged to David Moneypenny, a ship’s painter who worked on the first-class quarters. For him, for his colleagues, for Belfast and for Protestant Ulster, this was a moment of extraordinary accomplishment. Titanic was at the leading edge of twentieth-century technology. That such a world-beating ship was created in an Irish city was astonishing, but then Belfast was a new kind of Irish place. It had grown at a phenomenal rate, surging past Dublin in 1891 to become Ireland’s largest city, and growing by another 35 per cent over the rest of that decade. Titanic was built on an existing foundation of industrial and technological superlatives: in 1899 H&W had launched the world’s largest ship, the Oceanic. Belfast also had, as Jonathan Bardon notes, the world’s ‘largest rope works, tobacco factory, linen spinning mill, tea machinery works, dry dock and aerated water factory’. There was no chance that southern Ireland, lacking this kind of globally significant industry, could have produced Titanic—it belonged to an imperial and industrial world. Its creators were largely Protestant—2000 Catholics worked in the shipyard but they were not part of its official story: the ship was universally hailed as a ‘great Anglo-Saxon triumph’. With the industrial north-east so deeply integrated into an imperial economy, it was never likely that the idea of a Home Rule Ireland, dominated by agricultural interests and heavily influenced by the Catholic church, would be easily sold to the Protestants who built Titanic. Indeed, Titanic herself came to be represented in popular culture through two quite different versions of Ireland. One was the steerage-class emigrants among the 1500 who drowned on the early morning of 15 April 1912 when the great ship sank on her maiden voyage. The other was an Ulster Protestant identity, in which that tragedy seemed to foretell a wider doom, an almost apocalyptic sense of threat. Three days after Titanic sank, the third Home Rule Bill was introduced into the House of Commons in London. Three months later, vicious and organised assaults forced all Catholics out of the shipyards. On 28 September, 237,000 men and 234,000 women, from all classes of Protestant Ireland, signed the Ulster Covenant or an associated declaration, committing the men to ‘using all means which may be found necessary to defeat the present conspiracy to set up a Home Rule Parliament in Ireland’. In January 1913, the Ulster Unionist Council, under Dublin-born Edward Carson, decided to organise 100,000 signatories of the covenant into an Ulster Volunteer Force and to train them in the use of firearms. These events created two paradoxes: a violent loyalist rebellion against the state to which it pledged its allegiance, and an Irish nationalism appealing to the idea of a unified nation whose existence was anything but obvious.